Harare (Agenzia Fides) - "The victims very often come to the church to seek help and visit our hospitals, and we bring those cases to the attention of the government, so they serve as evidence of what is happening", said Fr. 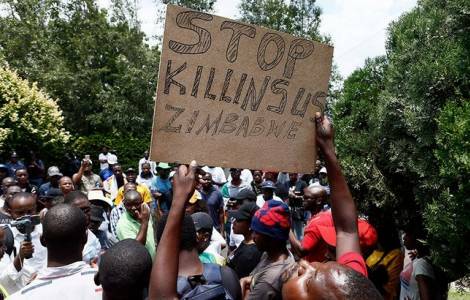 Frederick Chiromba, Secretary General of the Episcopal Conference of Zimbabwe, where reports of violations of human rights and brutality committed by law enforcement agencies against protesters who are protesting for the fuel price increase decided by the government are multiplying. According to Fr. Chiromba, some non-governmental organizations have asked to visit the clinics run by the Church, while the Episcopal Commission "Justice and Peace" is gathering information on human rights abuses and violence. Although the Bishops denounce the "heavy hand" of the government, said they want to promote dialogue in order to overcome the crisis, as emerged from the meeting held by a delegation of the Episcopal Conference with the Vice President of Zimbabwe, Constatino Chiwenga (see Fides 30/1/2019).